‘Microsoft Magnifier’ creates a separate window that displays a magnified portion of your screen. You can also change the colour scheme of the magnification window for easier visibility. You can move or resize the Magnifier window, or drag it to the edge of the screen and lock it into place. This program is available on all Windows computers, click Start, point to All Programs and type in Magnifier. When Magnifier is open, you can left-click the Microsoft Magnifier icon in the tool bar in order to change the Magnifier options, or to hide or exit Magnifier. 1. To invert the colours for better readability, select ‘Invert Colors’. This might be useful if, for example, a document has black text on a white background but for you, white text on a black background is easier to read. 2. By default, the Magnifier window appears docked at the top of the screen. You can resize or move the Magnifier window to a different location. 3. To dock the Magnifier window to the edge of the screen, select Docked, and then click a location from the Dock Position list. 4. To see an enlarged version of what your mouse is pointing at, select Follow mouse cursor. 5. To see the area where your pointer moves when you press the TAB or arrow keys, select Follow keyboard focus. 6. To see what you're typing, select Follow text editing. 7. To resize the magnification window Move the mouse pointer over the edge of the magnification window until the pointer becomes a double-headed arrow (on some computers, the pointer might change to a different form) and drag the window border to resize the window. 8. Magnifier can display objects on the screen up to sixteen times larger than actual size. In the Scale Factor list, select a level. The zoom level in the Magnifier window will change right away. Adjust the level until it's right for you. 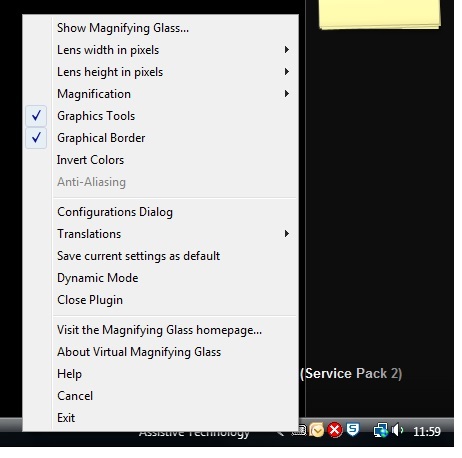 ‘Magnifying Glass’ places a magnifying glass on the screen which follows your mouse. The lens width and height can be varied to suit the user and the magnification level can be set using the scroll button on the mouse or by using the menu. The program shows a magnifying glass lens that follows the mouse movement. You can move the lens around the screen to view magnification of any screen area. To close the lens, click the left mouse button. Virtual Magnifying Glass also adds its own system tray icon. Left-click on the icon offers a shortcut for launching the lens again. Dynamic Mode: For Windows 2000, XP and Vista you can use the Dynamic Mode. Right click the magnifier and select Dynamic Mode.